The ongoing re-striping of Mahone and JJ Clarke drives is already causing confusion for motorists. The striping began this week, and many residents assumed the removal of the yellow curbs that had been put in place to prevent on-street parking along the one-ways simply meant the roads would revert back to their original state – in which on-street parking was allowed in front of residences along the two-lane roadways. But the city announced late last week their intent to reduce Mahone and JJ Clarke drives to one traffic lane moving east and west respectively, with the southmost and northmost lanes of each street now designated “parking lanes” for use by those living along them. In addition, bicycle lanes have also been added adjacent Eagle Draw on both one-ways. 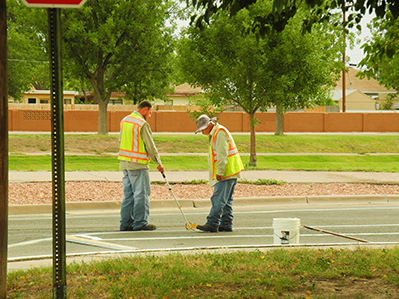 Workers performing the striping have been making their way in increments along the one-ways, and many drivers contacted the Daily Press expressing confusion, stating they were unaware when the traffic pattern change was intended to take effect and whether it applied immediately to portions of the roadways that had already been re-striped or did not apply until the entire project was complete. Cmdr. Lindell Smith of the Artesia Police Department says police consider the new pattern to be in effect now, meaning drivers should be travelling down the center lane – between the bike lane and “parking lane” – only. Smith says the south lane of Mahone and north lane of JJ Clarke should not be used for through traffic. As for turning onto side streets, Smith says curbs will be marked yellow at intersections, with arrows indicating turn lanes. “This is not an opportunity to pass; rather, it is a lane to act as a buffer between parked cars and cars travelling in the driving lane. It is marked with diagonal lines delineating it is not a driving lane,” he said. Along Eagle Draw, yellow curbs will be painted to indicate no parking in the bike lanes, and no-parking signs have also been installed. Many residents expressed displeasure this morning over the change, calling it “convoluted” and “ridiculous,” among other adjectives. Some wondered why the roadways did not simply return to the pattern that had been in place before the curbs were painted yellow, a pattern to which Artesians had been accustomed for decades and that also allowed for residential parking, when needed. They say the one-ways were intended to serve as a “loop” of sorts in order to allow drivers to make their way through town without using the highway if they preferred, and they anticipate the roadways will now be congested and dangerous, particularly with traffic backing up at intersections like Bowman Drive, 13th Street and Seventh Street once school resumes in the fall. “I don’t get why you would make something more complicated than it ever was or ever needs to be, just because a few people wanted some extra parking at their house,” said one man, who asked to remain anonymous. “Don’t we all want extra parking at our houses? And will the city rearrange our streets for us? One resident of Mahone Drive has been attending Artesia City Council meetings for many months, pressing for the city to restore parking along the one-ways. A second attended a meeting with a petition in hand from other one-way residents. That petition was provided to the council, and it is unclear to the Daily Press how many signatures it contained. While most houses along the one-ways were built with large and/or expanded driveways, likely in response to the location, a few have traditionally-sized driveways. The resident presenting the petition to the council said those living along the one-ways often had difficulty accommodating guests at their homes for barbecues or holidays. The residents had also complained to the council about the high rates of speed at which some drivers travelled along the roadways. While many citizens also complained today that the city “has basically sprung this out of nowhere” on drivers, Smith stresses again that – like it or not – the new traffic pattern is in place effective immediately, and drivers should utilize caution in the area. “Motorists need to remember, the speed limit is 25 mph down Mahone, JJ Clarke and Centennial,” Smith said. “This is a neighborhood, and people live there, kids play there, and people visit the surrounding parks there. The speed limit and traffic patterns may be new and unfamiliar to people, but the fact is the residents spoke up and the city listened, so now we have to follow the rules of the road, no matter how slowly people are travelling in the one driving lane on each side of the draw.